Adding content through the SharePoint browser-UI is generally workable (especially if you use the super cool 'data sheet' view), but it lacks some of the richer formatting options that one finds in most modern browser-based content editors, such as the Hotmail editor. For me, the most frustrating missing feature is support for rich hyperlinks, i.e. allowing the user to set a 'Display Name' separate from the url, e.g. Microsoft. Well, as it turns out, I found this limitation to be so much of a problem that I was able to get us to sneak in support at the 12th hour. 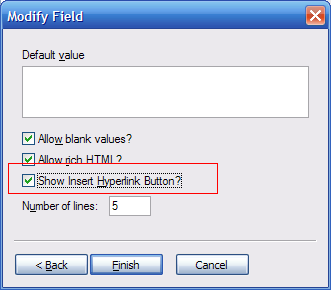 Sadly, it was too late to turn it on by default, but if you know the magic incantation, you too can turn on the 'Insert Hyperlink' button for any 'Rich Text' field in a SharePoint List. 1) Open your SharePoint site in FrontPage 2003. 2) Right click the list that has the Rich Text field and select 'Properties...'. In this case, I'll use the common 'Announcements' list. 3) Select the fields tab in the dialog, select the Rich Text field you want to work with (e.g. Body) and click the ‘Modify’ button. 4) In the Wizard dialog that comes up, click 'Next'. 5) You should see a page like this. Toggle the 'Show Insert Hyperlink Button', click Finish, ignore the annoying warning message that comes up, and you're done! Result: You now have an 'Insert Hyperlink' button on your rich text editor! Thankfully, the new version of SharePoint (WSS v3) has a *much* better content editor than v2. And yup, Insert Hyperlink is now there by default!